Life isn’t ALL about wine, or so I am told. In fact a friend of mine calls himself the “Liquid Agnostic”, because unlike me he believes in exploring all sort of drinking categories, including beers, spirits, tea, coffee and more, and he doesn’t understand my reluctance to explore further. So, with plenty of encouragement, I decided to venture into the world of beers to give them a chance, as I’ve never really been much of a fan. I do recognise that my prejudice is similar to that of people who tell me “I don’t like wine” after only ever having tried the £3.99 special from the local supermarket. Knowledge and Appreciation do require Experience. 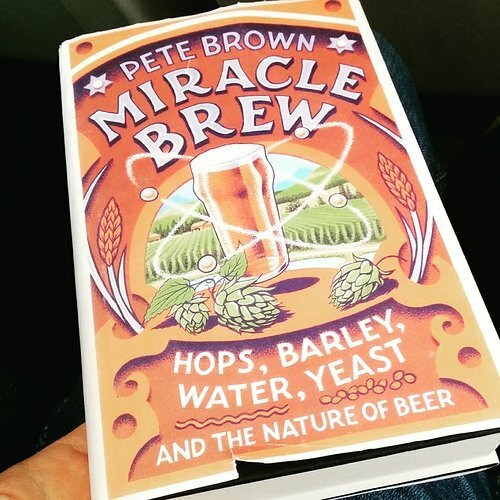 I thought I would start to explore the world of beers, so to get me started I bought Pete Brown’s new book called "Miracle Brew". I would highly recommend it to you, whether you already enjoy beers already or not. It is a fascinating exploration not of beers themselves, but of the ingredients that are used to make beer, and their importance to the final product. Whilst Pete does take a couple of swipes at the wine world, he actually managed to educate me as to the complexity of beer, and its importance culturally in local areas as well as a beverage to be cherished - there really is a beer ‘terroir’. Are there others holding out against a better beer education? Or are you already beer converts and liquid agnostics? Are there ranges that you would recommend to get a beer novice started? I’m definitely in the liquid agnostic camp. I mean, wine is my favourite but anything with a sense of place and variation in taste does it for me, starting with coffee in my late teens. The thing with beer, particularly ale but anything fresh and living, is it really doesn’t like to travel. Local, fresh bitter in good condition is so different than a mediocre pint of mass produced beer pulled from a careless pub. The other important point to note is there are loads of styles. It’s not just about the ultra hopped strong craft beers. Taste a wide range of styles at firsts. They are as different at shiraz and chardonnay! The other important point to note is there are loads of styles. It’s not just about the ultra hopped strong craft beers. I’m far more conservative in the styles of beer I like compared to wine. I am very averse to the seemingly trendy overly hopped beers, or to the richer, maltier, nuttier ones too. I tend to choose a middle ‘session’ path (in the beer style sense, not the hours spent drinking sense!) but I do need flavour. More into ‘real ale’ rather than ‘craft beer’. Given that I like Fino & Sauternes, Champagne and Lambrusco, gamay and pinotage, pinot blanc and white Rioja, it seems bizarre that I don’t like a wide range of beer flavours. And goodness knows, in the name of research I’ve tried! I never thought I really ‘liked’ beer much until I started trying different craft ones. I can’t claim to have any real beer smarts but the more I try, the more I fall in love. I think I’d like to read this book but probably not before trying a few more styles to get a flavourof what I like before I get too bogged down with the details. I don’t wish to sound unpatriotic (!) , but I think trying as many beers from around the world as possible was part of the key to unlocking my love of craft beer! For instance, when I discovered Einstok (Icelandic!) beer and fell in love with their white beer, as well as their toasted porter, it was such a lovely surprise as I hadn’t been a fan of witbier or porters much before. I also love the weird and wonderful American breweries. And I know it’s super-trendy so I’ll probably sound like a right hipster but I tried sour beer recently that was another pleasant revelation. Also tried a raspberry ripple ale (I’m afraid I can’t remember which one!) and that was wonderful. Basically, I’d say try as much as possible and don’t be afraid of not having an official beer ‘knowledge’, I think what’s most important is finding beers you like and then trying to learn why you like them. If anyone’s had it let me know? Welcome to the world of beer Robert! If you wanted a handy starter pack then I’ve found The Wine Society have started focusing on a specific brewery and then putting together a little mix of that brewer’s beers so you can taste their different styles etc. I really wanted to like this one but found it just too salty-sour unfortunately. I’ve still got another can so may try and give it another go but in the meantime I’m loving the Clwb Tropicana IPA! It’s so zesty and refreshing! Henry Jeffreys has reviewed the book in the TLS and on his blog. I officially hate beer but this has converted me - I’ve even felt compelled to submit a review which is unusual for me. Utterly delicious and a revelation really. This is now £6 off. What not to like! That’s absolutely brilliant news @cgoldin Chuffed to hear that you’re a beer convert already! As @catherine said, the Mocha Porter is delicious and will hopefully shatter any preconceptions you may have had that dark beer just tastes like Guiness My personal favourite from the collection was Faith but they’re all delicious in their own right! I’m still treading warily around the ‘craft beer’ that’s been much written about (hyped?) over the last couple of years. I’m not really sure what the term means but I’m pretty sure I don’t like the typical price. Mind you, a pint of traditional bitter is not cheap these days either. Not that I’m a traditionalist; I just like the flavour of bitter. The trouble is that I’ve tasted a few and can tell when they’re off-form, and they’re below-par far too often, notwithstanding schemes such as Cask Marque. Pale ale seems to mean something else now. In the past it was a close relative of bitter but these days the colour borders on golden, the flavour is citrussy and the abiding impression is of a half-way house between lager and bitter: an attempt to woo lager drinkers for whom bitter may be a bridge too far? No, I haven’t, Robert, but it sounds good. I may look into it. Sooner or later I’ll go back to the National Brewery Centre (formerly ‘Bass Museum’) just down the road in Burton-on-Trent, to remind myself how beer is brewed. The exhibits there provide a very clear explanation of the process. At the end of the tour you get a sample half-pint. I’m not sure of what, though, but I believe it’s still brewed on site. Back in the days when the place was called the Bass Museum, the Bass served there was far superior to any Bass that I had had (or have had since) in a pub - a bad reflection on pub landlords. Good to hear you’re starting to become a bit more open to craft beer @Bill Craft beer is essentially beer created by small, independent breweries although the lines do start to blur when we start talking about Brewdog and other large craft breweries - independence probably remains the most important part though in my opinion. While I can’t say I know the pub scene in Derby all that well I can tell you that you have two excellent breweries just up the road from you. One is Buxton (based in, erm, Buxton) and the other is Thornbridge which is based in Bakewell. If you get a chance then I’d highly recommend checking either brewer out as they straddle the line of craft beer and traditional ales in that they produce both - and both are equally excellent! Yes, Thornbridge have a very good reputation. I occasionally see one of their beers on sale in Derby. I have yet to taste any of Buxton’s output. We’ve had “small independent breweries” around here for a long time, and they (and we drinkers) have managed fine without having recourse to the term “craft brewery.” It seems to me that the phrase has more to do with marketing than with meaning, and I seem to remember a section of CAMRA’s “Good Beer Guide” from a few years ago that said “no two definitions of the term are the same” - but my investigations are at an early stage and my mind remains open. Just saw that this porter is 50p off per can, I tried and really enjoyed its richness and coffee notes, a perfect winter warmer.